This roast of lamb surrounded by whole garlic cloves makes a succulent centerpiece for a special dinner. 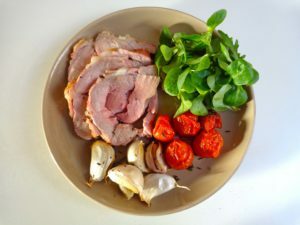 Fresh thyme adds a touch of Provence, and you can serve the lamb with roasted cherry tomatoes and some tender greens to make a lovely plate. For easy carving, have your butcher remove the upper layer of fat and bone, roll and tie the roast, leaving the shank intact. If this isn’t possible, you can roast the shoulder as is. One shoulder of lamb will serve 4-5 people, or 3-4 hearty eaters. For tips on the roasted cherry tomatoes, see below. Remove the lamb from the refrigerator at least an hour before you plan to roast it. Preheat the oven to gas mark 7 (4oo F, 210 C). The roast should still have some fat on top. Use a very sharp knife to score it in a diamond pattern. This prevents shrinkage. Separate the garlic cloves, but do not peel them. Coat a roasting pan with the olive oil. Place the roast in the pan. Scatter the garlic cloves around it. Scatter the thyme over the top. When the oven is good and hot, put the lamb in and roast for 35-40 minutes for medium-rare meat. You can check to see if it’s done by inserting a fork into the deepest part of the roast. If the juice is red, it needs a little more time. If you prefer your lamb rare, roast it for 5-10 minutes less, and for well-done 5-10 minutes more. When the roast comes out of the oven, let it sit for a few minutes before carving. Sprinkle the slices with salt and grind on some pepper. Serve on a platter surrounded by the roasted garlic, accompanied by your veggie of choice. Serves 3-5 people. 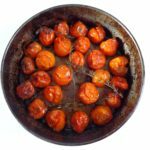 If you’d like the idea of roasted cherry tomatoes, spread about a tablespoon of olive oil a tin, add about a pound of tomatoes and roll them around to coat them with oil. Sprinkle with salt and pepper and scatter some thyme on top. 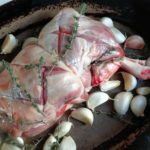 The roasting time is about the same as for the lamb — 40 minutes or so, until they are starting to brown — so if your oven is big enough you can cook them at the same time.